Whale lovers know that the mysterious giants of the sea aren’t meant to be contained. 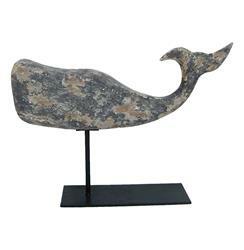 Here’s the next best thing – a vintage replica whale that appears to have been rescued from a shipwreck's treasure chest. Now you can skip the rough seas of the whale watch tour and gaze at this manageably sized whale in the comfort of your own home. Great for an industrial, urban loft or French country living room.